What's going on? 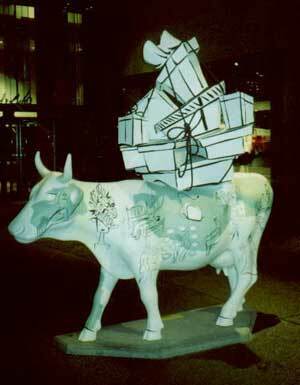 The Chicago Department of Cultural Affairs presented Cows on Parade. 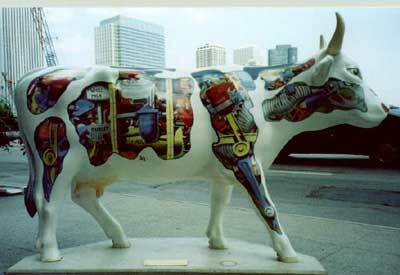 Cows, not real ones, but fiberglass-facsimiles of life-sized cows, 300 of them, were painted, decorated, immortalized and set out to graze around downtown Chicago for the public's enjoyment. In other words, it was a public display of art on the hoof. Why cows? 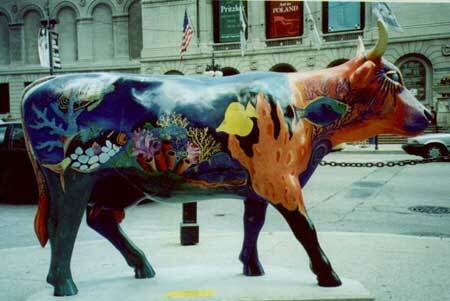 I guess for some people, Chicago is a cow town. Think of Frank Sinatra, who sang, "…the stockyards, Chicago is…" And then there was Mrs. O'Leary's cow, another reference to Chicago and its world-famous fire. There are probably lots of other Chicago cowisms that may come to mind, but realistically, from a painter's point of view, a side of beef has a great deal of display potential. err...cowhide, I guess is the correct term for it. Where were they? 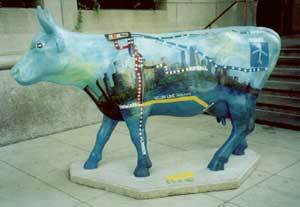 Most of the 300 cows were located along the streets of downtown Chicago, although you might have noticed a few strays in other parts of the city. The Department of Cultural Affairs printed up a "cattle-log," which was a cow-shaped map-locator of these beefy works of art that also gave details about each particularly serving (er…work of art). Here's Bossie in the garden having a little snack. Grazers never had it so good. This looks vaguely like a public transit map and a city skyline. Perfect for helping tourists find they way around. Here's one of my favorites. This cow is Hawaii! Oh, by the way, that's my nephew Ryan McDougal on the right. 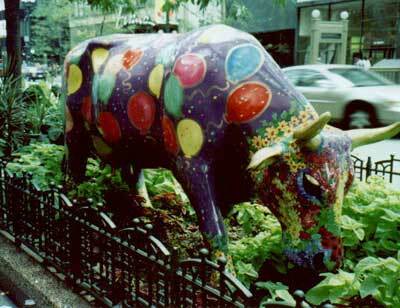 Chicago's Cows on Parade was a huge success and as a result other cities around the U.S. have mounted their own shows. 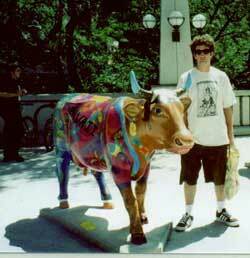 The public seems to love the cows, apples, sharks or whatever fiberglass shapes the city think tanks can come up with. So hats off to Chicago for a great idea! Giddy-up little doggies. Burgers, anyone? Photography credit for this article goes to Nancy Fox, the phantom's sister-in-law and Clever contributor.